Eddie Walker (affectionately known as Razor Eddie) Will never forget the time he asked to use some of my toothpaste and then waited for me to finish brushing my teeth so that he could use my toothbrush too. Quite a character. After I returned from my stint at the Crotchet Factory, Eddie had disappeared and I have no idea what became of him. Did he used to clean his teeth??? They look like they’d been ravaged by a pair of pliers and a hammer. 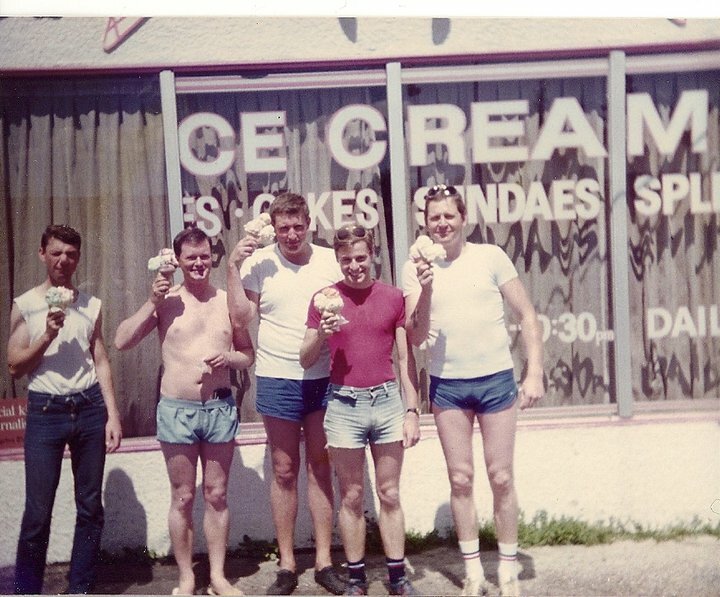 This Photo was taken outside the Dairy Queen, which was a five minute walk from the Barracks occupied by Princess Patricia’s Canadian Light Infantry, just off the Crowchild Trail in Calgary in July 1984. When I first heard that ‘Razor Eddie’ was coming to the Band I thought he had probably earned his nickname through being some kind of hard man. The truth was that just like his toothbrush, he borrowed other peoples spent Bic razors and left his face looking like a war zone after every shave! He came to the Band mainly to add his incredible Irish brogue to the Dance Band, and to be fair, he was a hell of a singer! I often wonder how he survived in civvy street.